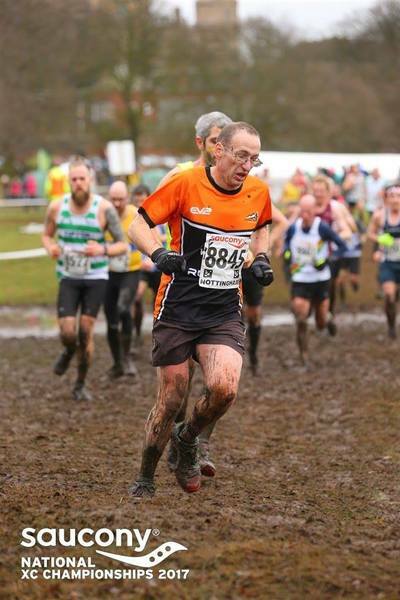 It’s long been an ambition of mine to take part in the National cross country race. Seeing as it was localish in Nottingham I thought why not. You don’t have to be an elite runner to enter, just a 1st claim member of a club. After watching a couple of races and surveying the course we went to get ready. It started to rain, argh sugar. Just what we needed. Thankfully before the start it had stopped. At arriving at the event we had noticed that EVERYONE coming off the course was covered in mud. Interesting! The men were as usual last to race so the course was somewhat worse for wear after the previous 8 races. Into the pens as there was so many of us and Off we went, it was like charge of the light brigade up the field. The course was 1 small lap, 1 medium lap, 1 large lap followed by one extra large lap. I thought it actually worked well as only if you were really slow did you ever get overtaken. At the top of the first hill you turned to go downhill, it was a fantastic site to see so many people out in front of you. There was some behind me to I might add. 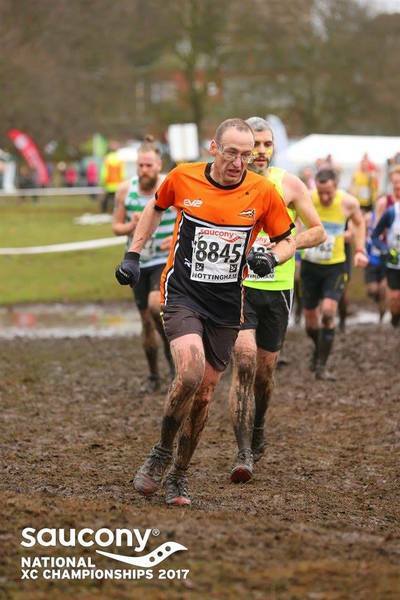 The features of the course were flat grassy bits, flat muddy bits, muddy hills, muddy downhills, streams to cross ( more like mud streams ), large muddy bogs and more large muddy bogs. I counted that we crossed a muddy stream or a muddy bog area 12 times during the race. At one point it was actually a fast walk more than run for me. It was supposed to be 12k but actually came out longer as our garmins both showed 7.8 miles. My goal was as usual to start at a steady pace and try to keep to it with a target goal of just under 1 hour. Just missed out at 60.05 but as it was long I think I achieved my goal. Lee had a fantastic race and finished in 51.56. How many times can he run as fast as that and still only finish in 739th position. 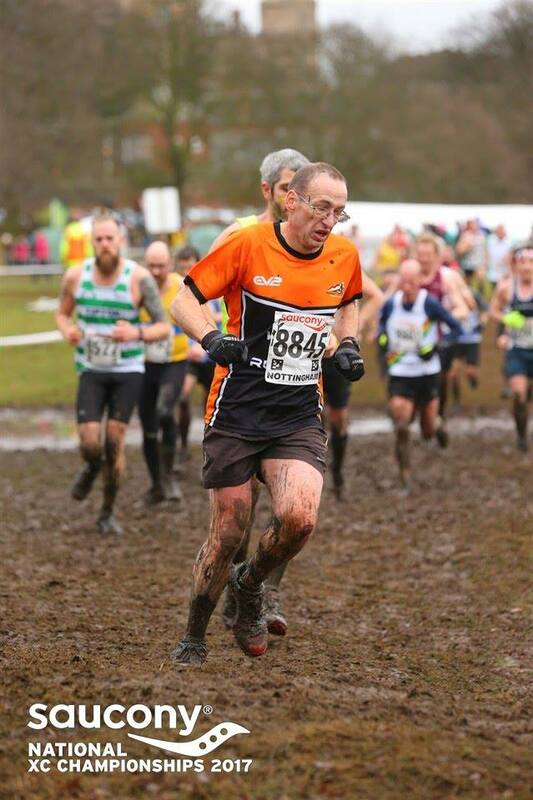 That shows what class of runners take part in these events. Winner did it in 39 mins – wow. Lee and I absolutely loved the day, the experience, the event and of course taking part. Bring on the mud is what I say and we will be back for more for sure. This is proper racing. No medals, no T-Shirts and no goodie bag. £7 and worth every penny in my mind. That’s what I love about Cross Country! ​​Keen to make 2017 a year for trying brand new races - I started off the new year with Walton on the Hill for their inaugural race. We found the school in the village pretty easily and there was plenty of parking. It was a rather chilly morning so we made a quick dash up to the sports hall to collect our numbers and await the start. We were told that the briefing was at the start line which was less than a five minute walk down from the school - but whether his loud speaker wasn't working or there was just too much noise from the 261 participants the only noise I heard was the starting horn. I have to say it wasn't the best starts I've encountered. It was a very slow start due to a narrow lane which sloped down and turned right and then up a slight hill (in comparison to what was to come later this was merely a blip in the road !!!). The road then opened up and we headed down the Brocton Road into Brocton. The toughest part of the race then followed which took us up the Chase Road, I have to say when we saw this hill having come into Brocton we thought 'oh boy', it just went on and on and on. When we eventually got to the top it had started snowing, only a few flakes but still it was snow and cold. Just when we thought we had finished with the hills we saw a sign that said 'Hidden Dips for 1/2 mile', but not letting that dampen our spirits we carried on and eventually started out decent on Camp Road which led us onto the A34 Cannock Road. Truthfully here was where they needed to re-assess their risk assessment. There was a marshal at the top of the road and then one at the bottom, but the cars were flying past at some speed and it didn't feel very safe to be running on such a fast road. The down hill section lasted for just over 2 miles and then it was a fairly flat run back to the school (except for a little hill back into the village !!). The wind had picked up when we did arrive back into the village and I turned one of the last corners before entering the school grounds and it took my breath away. Despite the tough climbs, I completed the race in a chipped time of 54:21 minutes, I was the 30th female across the line and 6th in my age group. It was a good, challenging course however with an 11 o'clock start it meant that the A34 had quite a bit of traffic on it. I know from reading other comments that it has been suggested an earlier start would be better as there would be less traffic travelling into Cannock Chase. This aside it was a well organised, sell out event. A nice goody bag and medal. I would consider doing it again next year if the start time was earlier. Now to get ready for Shrewsbury 10K on March 19th. After a short drive over the boarder to Wrexham, we were only a few miles away from the start when Lee suddenly announced he had forgotten his Garmin (school boy error). This obviously did not slow him down! We pulled in to the parking area for the half marathon. Not the most inspiring start and finish area, as it was in a large industrial estate. It was a half mile walk to the start, quite entertaining watching a lorry trying to manoeuvre through all the runners walking to the start. After a quick team photo minus one who fancied going over to the blue side, it was time for the start. It was very crowded at the start but it soon started to thin out as we went past the finishing line for the first time. It was one small lap followed by a large lap which meant you went past the finish at 1 mile and 5 miles. 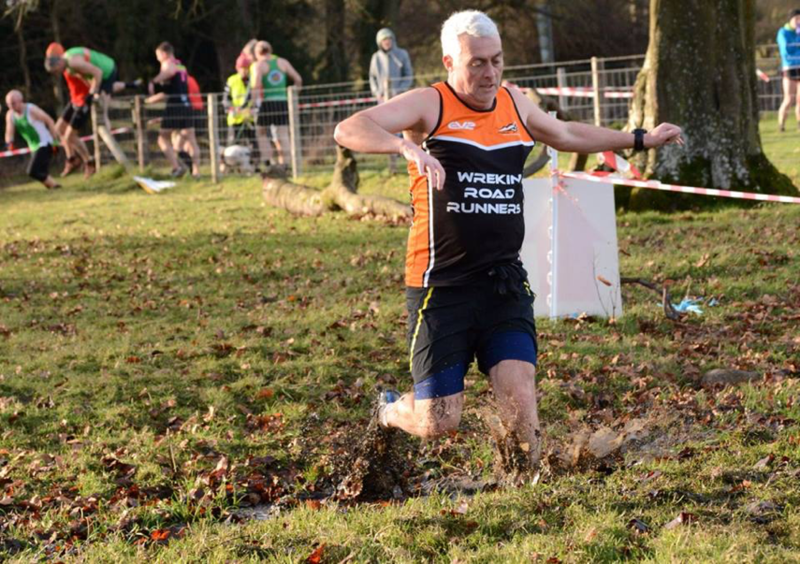 Most of the course was out into the countryside on a very flat course with plenty of water stations. 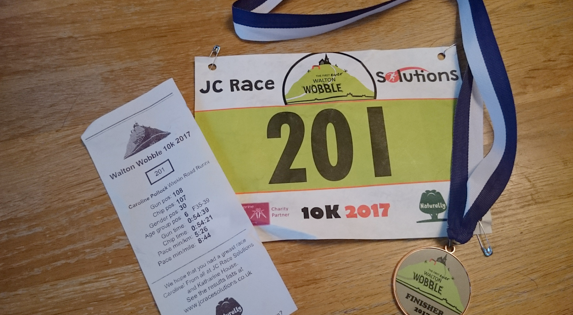 It was not the most scenic course but it was flat, fast and the organisation was excellent with a nice medal and a pack of crumpets at the end. ​Would definitely go back next year. As like all the previous races we were blessed with lovely weather as we travelled to Oswestry. Paul and Darren did a recce of the course and although it was undulating looked ok. The ladies as usual went first and did a small lap of the school field followed by a large lap of the course. Ceri arrived with about 5 minutes to go before the start blaming traffic etc. Four wonderful ladies took up the challenge and after first small lap disappeared into the distance. It seemed a long time before anybody appeared and we all said where have they gone? The men did one small lap followed by two big laps adding up to 6.25 miles. Personally I always use the strategy of starting nearer the back and slowly picking people off trying to stick to an even pace. This worked fine as I was not overtaken during the whole race. 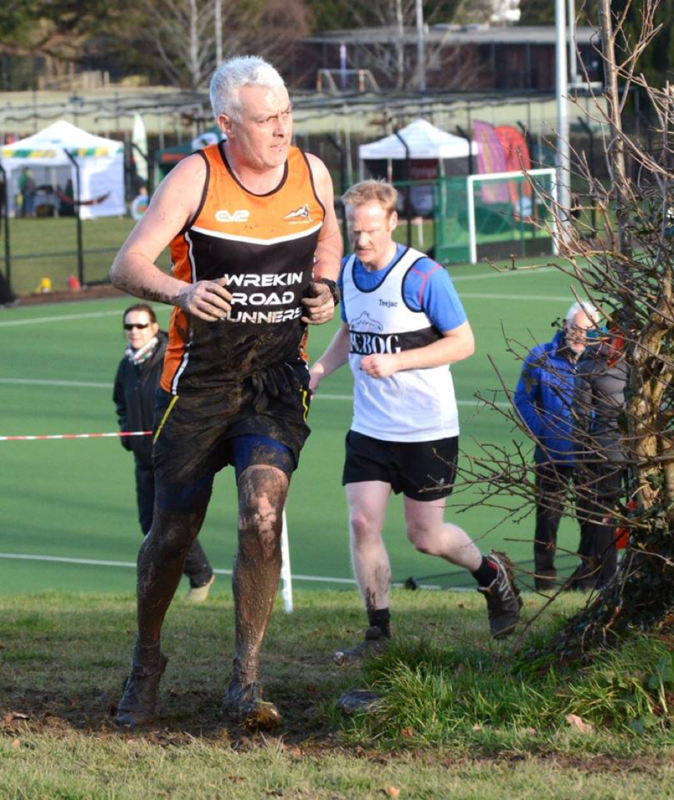 Darren who is not a fan of cross country but does it as part of winter training was having a different race with him deciding to test out the depth of the muddy ditch by falling down into it. He returned wearing a mud made set of tights – top effort as he was still smiling. The whole series has been a great experience for all and as usual everybody has stepped up to the challenges thrown at them. 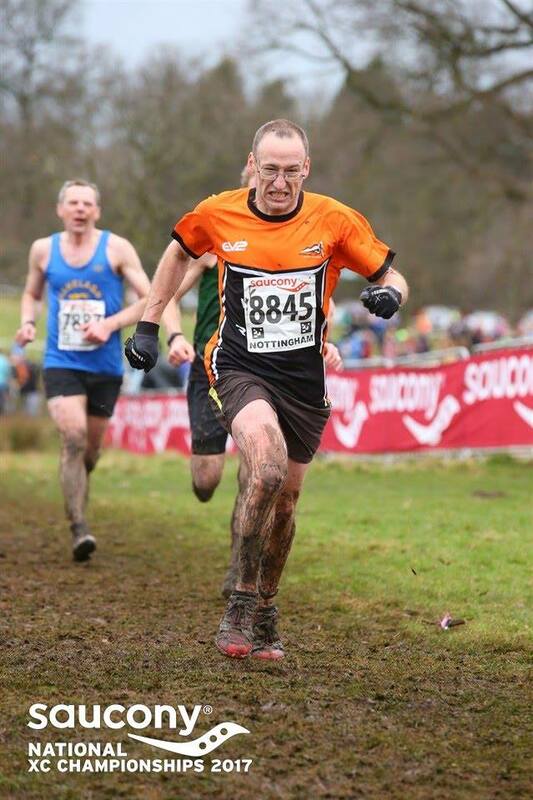 We all will be back next year for more sweat, mud and hills. It will be great to see more of you taking part.